Google Reader is shutting down -- what do I do? (MoneyWatch) Google (GOOG), which is fairly infamous for summarily shutting down unprofitable services and products, has dropped the axe on yet another one: Google Reader is being shuttered. Unlike some of Google's other discontinued products, though, the RSS feed-reading tool seems to enjoy significant popularity. Many professionals use it to aggregate industry news and analysis and have relied on it daily for years. The silver lining: First, Google Reader isn't going anywhere for a few months. The official shutdown date is July 1, so you have that long to come up with a Plan B. The Old Reader. The Old Reader is a solid RSS reader that looks and works a lot like Google Reader, so the learning curve is pretty shallow. It's also easy to import your subscriptions from Google Reader, so you can be up and running in just a few minutes. Feedly. 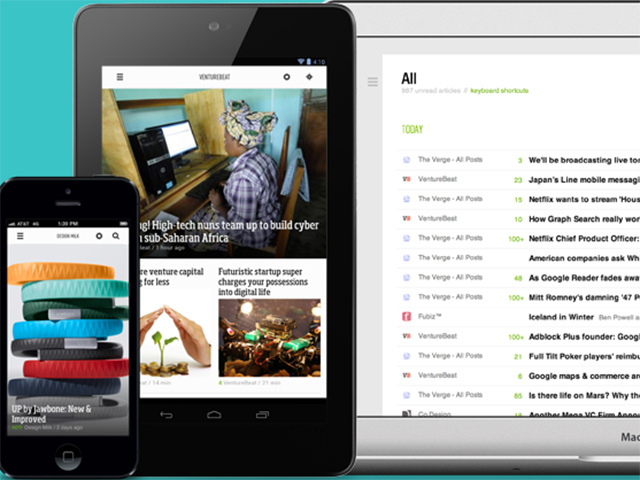 As soon as Google announced that they were discontinuing Reader, Feedly was welcoming Reader users into the fold. Importing Reader subscriptions is a snap, though the interface takes a little getting used to. You might appreciate the variety of layouts; you can browse your news feed in a traditional headline-only style or see stories arranged in a magazine-like, visual tile arrangement. NewsBlur. I like NewsBlur a lot. It has a great visual presentation, and you don't have to learn a whole new way of doing business if you transition from Google Reader. Unfortunately, the free version is woefully underpowered, allowing just 64 blogs and 10 stories at a time. For all the bells and whistles, you need to spend $24 a year, so I'd recommend sticking with one of the other options unless you really fall in love with NewsBlur.